Buddhas, Bodhisattvas, Venerable Master, Dharma Masters, Good Knowing Advisors, and Dharma Friends. Not long after I came to CTTB, a wise advisor encouraged me to take the Bodhisattva Precepts when the opportunity arises. Around the same time, I vaguely remember a layperson asking me if I knew when the last Bodhisattva Precepts transmission was and when the next one will be. I did not know the answer. I assumed that during each Dharma Assembly, there is a precept transmission and anyone who signed up could receive it. I soon learned that that was not the case. One day, I went to work at the Bookstore and saw a poster notifying that CTTB will hold a ceremony for the transmission of the Bodhisattva Precepts. Just knowing that was enough, so that I could pass on the info if someone else asked. I didn’t really pay much attention to it other than just knowing the date of the transmission. Every day that I go to work at the Bookstore I would see the poster, but I can’t remember how many times I looked at it before I realized that there was an application deadline. At that time, I wasn’t really interested in taking the Bodhisattva Precepts, so it didn’t really matter to me anyways. One day, in a conversation with Dennis, the topic came up. Dennis had received the Bodhisattva Precepts about 4 years ago in 2005 under Venerable Thich Nhu Dien and he encouraged me to sign-up. I thought about it for some time and we had several discussions before I decided to go pick-up an application and started to fill it out. The most difficult part for me was not making the resolve but getting to it. All these years, I thought I was upholding the Five Precepts pretty well. I also learned a lot from Dennis by observing him practice the Bodhisattva Path. As I filled out the application, I looked more deeply into how I have been practicing the Five Precepts. A few things surfaced that I became very afflicted with: One was the fact that I drank champagne--not only at my own wedding reception but also at my friends’ and relatives’ wedding receptions. The amount that I drank was probably not enough to have failed a Blood Alcohol Test. Even though I was not intoxicated, I was still afflicted by the fact that I drank a substance that is considered an intoxicant. The source of the second affliction that came about arose from a couple of events that happened during my college education. As a laboratory requirement for a course for my major, I had caused harm to the life of a mouse and a frog. At the time, I was concerned with fulfilling the requirement because I thought that if I didn’t fulfill the requirement that I would not be allowed to graduate. How ignorant of me! I only wanted to graduate, find a job, and make a decent living. Even though killing was not the intent, I was still severely afflicted. I was not able to get over the fact that I sacrificed these two living beings for me to have a living. For these reasons, I didn’t think that my application would get accepted so I did not submit it. But not submitting the application did not dissolve my affliction. Weeks passed and at the end of one of the Dharma Sessions, the Dharma Master made an announcement about the Bodhisattva Precepts Transmission. When I told Dennis that I had not submitted the application, he reminded me that there is a deadline and that space is limited. I was still trying to deal with my afflictions on top of everything else. I decided to wait until the last day to submit it. And since space is limited, I thought that if there was a chance for my application to get accepted, I wished for those who have made the resolve to have that chance before me. And if my application doesn’t get accepted, I would still be considered fortunate knowing that I am living in a community of the Four-Fold Assembly, where, compared to those living out there in society, is much easier to cultivate. I would concentrate on the Five Precepts which I believe is the foundation of all precepts. There were two other reasons why I hesitated to submit my application. They were my children Alan and Megan. I later realized that they are a part of the reason for me to take the Bodhisattva Precepts. Having to be away from them for a week for the Bodhisattva Precepts training classes would have been an issue for me. As a Mom of two young children, I also thought that it would be too difficult for me to completely uphold the Bodhisattva Precepts. My resolve would not have been as strong if Dennis hadn’t been so encouraging and supportive in my decision-making process. The deadline was nearing and I finally submitted the application. I entered the training session prepared to learn as much as I could. Throughout this period, especially during the repentance and transmission ceremonies, I experienced a kind of chill as if an electrical current had rushed through my body. I had feelings of tremendous gratitude towards the Buddhas, Bodhisattvas, Venerable Masters, Dharma Masters, and everyone involved. I was blessed with the teachings and care of the everyone from the Buddha Hall to the classroom to the kitchen. The gratitude I owe to all the Teachers and caring ones is comparable to the gratitude I owe to my parents. There is no better way that I can think of to repay everyone for their kindness except to diligently cultivate. One of the most valuable lessons that I have learned in practice resulted from having ants on the kitchen counter: Just to be alive and exist in this body, I am already committing all sorts of offenses. What am I doing when I wash my hands, take a shower, washing fruits and vegetables, sanitizing the dishes and the like? What am I doing when I take medicine to cure my ailments? Am I not selecting my own existence over the lives of other living things that scientists call organisms? How should I live in order to justify the selection of my existence over the countless microscopic organisms that are invisible to the naked eye? Just as the Dharma is difficult to encounter, so this the Bodhisattva Path to enter. 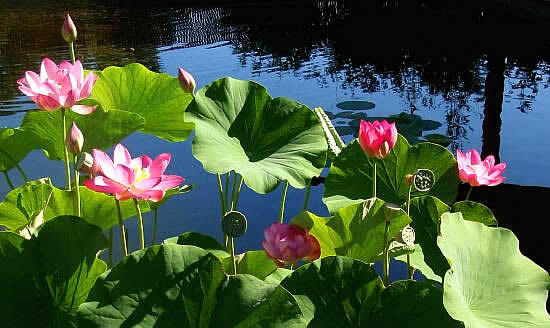 Now that I have been placed on the path, the three clusters of precepts will be my guide to benefiting living beings. I wish to walk 3 inches off the ground so as not to step on any living things. I wish to climb to the top of the 100ft pole and be free to roam as I wish. That concludes my talk tonight.